Here’s French method for cooking chicken in the slow-cooker. It’s based on a classic French recipe for “blanquette.” And guess what–I’ve solved the problem of flabby skin on slow-cooked chicken. Read on! Recently, on my Facebook page, I asked readers what kind of French recipes they’d like me to develop. Many of you said chicken, but added that you’ve always wondered how to avoid flabby skin on your slow-cooked chicken. Well, here’s how: Take the danged skin off! What about flavor, you ask? No problem: Use the cut with the most flavor: thighs. Boneless, skinless chicken thighs are the way to go, mes amis! I ask you: Who needs chicken skin when you have a chicken recipe with a flavorful, wine-laced, touch-of-cream-enriched sauce with mushrooms? That’s the secret here. After all, chicken blanquette was never meant to be made with skin-on pieces, so it’s not like we’re stinting on anything. 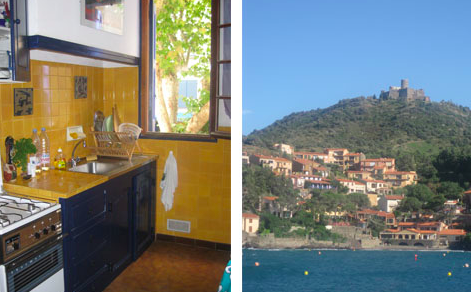 My little kitchen in my little town (Collioure). History of this recipe: I originally developed this recipe for the Better Homes and Gardens “Soups and Stews” book-a-zine. It was a plum assignment: When the editor contacted me, to develop some French stew recipes, I was actually in France, staying in a little vacation rental by the Mediterranean Sea. The weather had just hit a cold spell, and I was craving something warming and hearty—but something that tapped into the finesse that is France. My editor and I decided to focus the story on blanquette—a French stew that’s finished with a tumble of fresh vegetables plus a touch of luscious cream to make it white—blanquette comes from the French word blanc (white). 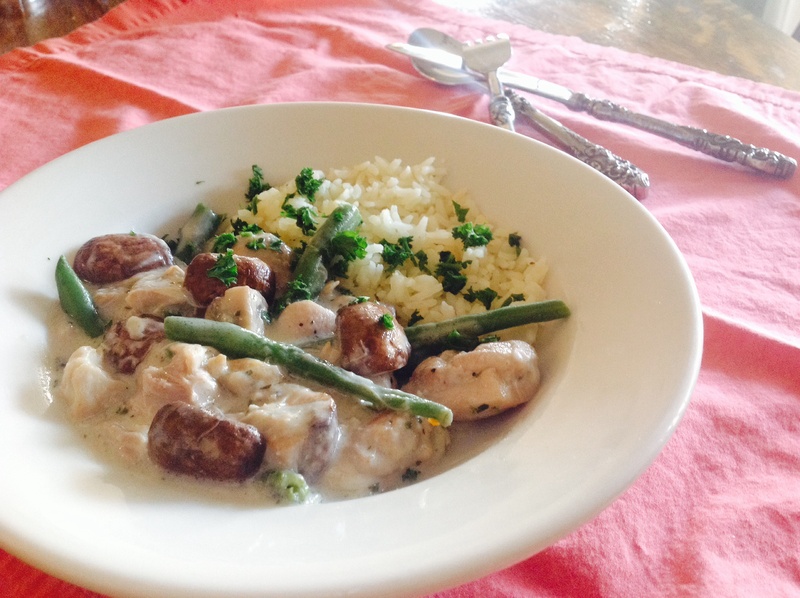 Blanquette is traditionally made with veal, but I turned to my French butcher to inspire other versions. I developed recipes for pork, lamb, and chicken. Now that you, dear readers, have asked me to develop more French recipes for the slow cooker, I’ve decided to adapt my Chicken Blanquette recipe for the cooker. So here it is! This is quite simply seasoned–the flavor comes in the richness of the wine-laced sauce that’s flavored-up with the ingredients below. 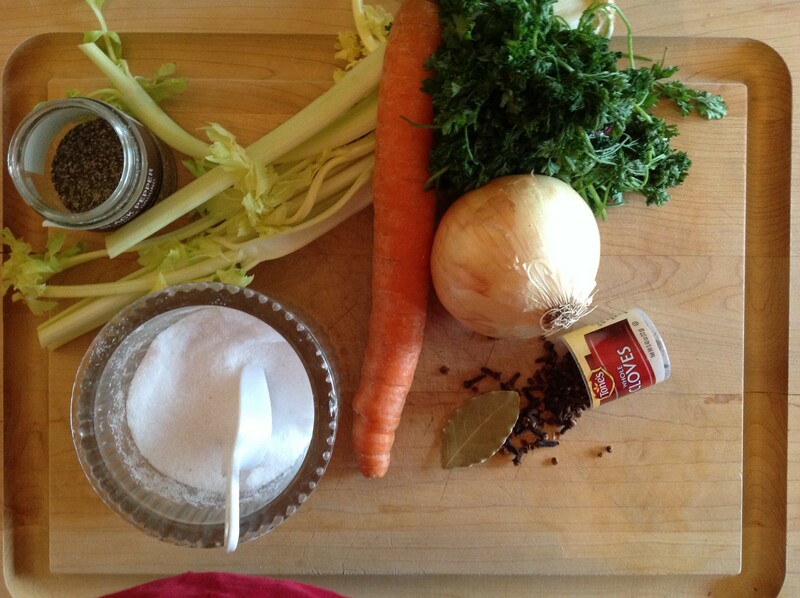 Salt, pepper, celery stalks, onion, parsley, bay leaf, carrot, cloves. Just tie together a small handful of parsley and a bay leaf. Avoid breaking the brittle bay leaf–you don’t want bits of bay leaf in your stew (it’s a food-safety issue). The bouquet garnie makes it easier to remove the parsley and bay leaf later. You can also use bouquet garnie bags (or spice bags), available at many kitchen stores. Stud one quarter of the onion with a couple of cloves. This makes the cloves easier to remove later. 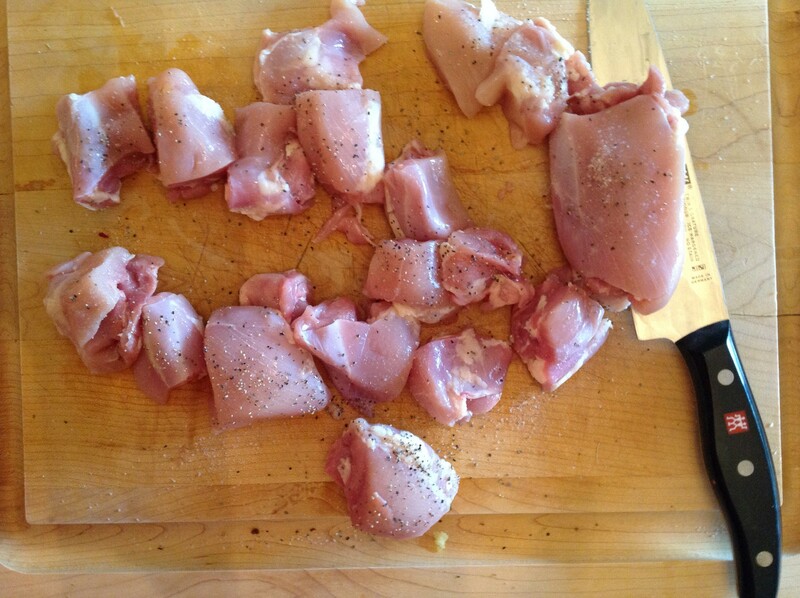 Cut the chicken thighs into semi-large (1 1/2 to 2-inch) pieces. If you cut them too small, they’ll break down into stringy bits during cooking time. You’ll lightly brown the chicken, then add the aromatics and cooking liquid (wine and broth). To note here: You want the celery, onions, and carrots in nice big chunks. They’re only here to flavor the broth. You’ll remove them later. I love my Cuisinart 3-in-1 Slow Cooker, as it lets me brown the meat in the cooker. Friends–in my view, the number one problem with slow-cooking chicken isn’t the flabby skin. It’s that you can’t cook it all day and expect it not to fall apart. I just don’t get these recipes that have you cooking boneless skinless chicken for 6 to 8 hours! It’ll end up breaking into strings. I cooked my stew on low, and it was perfectly done after 3 hours. It could have stood maybe another hour of slow cooking, but any longer and it would have been mush. So, I’m sorry to say that this isn’t the recipe to plop into the cooker in the morning and come home to after 8 hours of work. But it is a great make-ahead recipe for a cozy Saturday or Sunday night. You could probably throw the mushrooms and green beans into the cooker about 1 hour before the stew is done (if cooking on low) or 1/2 hour before the stew is done (if cooking on high). But I’m not that kind of cook. I like my veggies to be cooked with more precision; therefore, I cook them separately (don’t worry–you’ll only need one pot!). Thicken the stew with a beurre manie (butter and flour worked together into a paste); add the veggies, and you’re done. It’s a rather elegant dish, for a slow-cooker! Voilà! 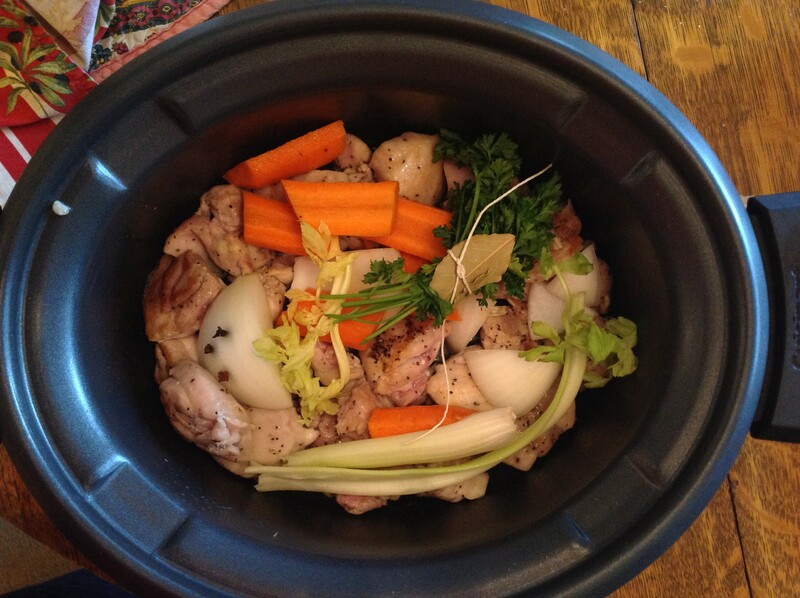 My French Chicken Stew–in the Slow Cooker. (a.k.a. 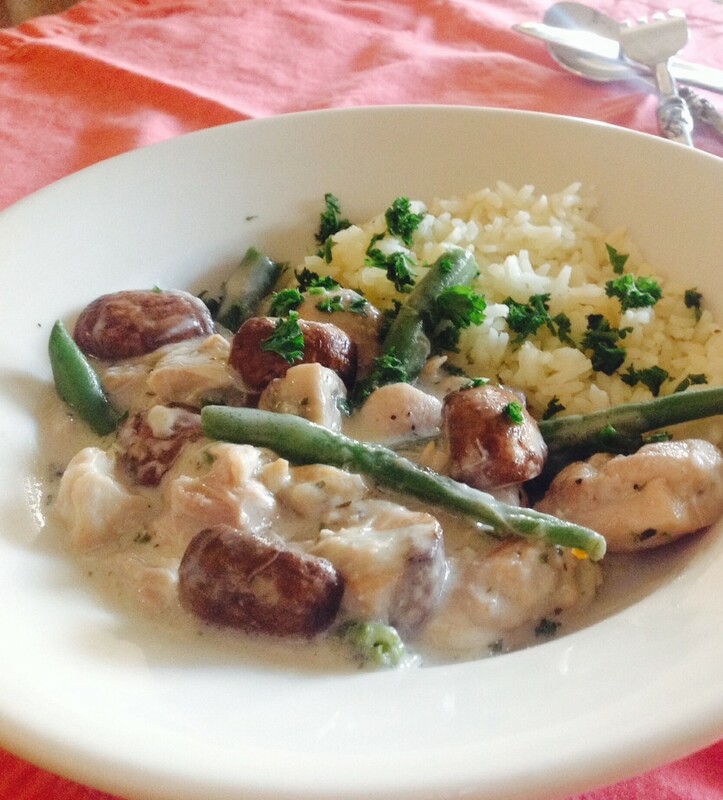 : Blanquette de Poulet Bonne Femme). Don't pass on this recipe because the ingredient list looks long--you likely have many of these things on hand already. PS: This is great with baked rice, pureed potatoes, or parsleyed noodles. Sprinkle chicken with salt and pepper to taste. On the browning setting of your slow-cooker (375°F), cook and stir the chicken in the hot oil until lightly brown. 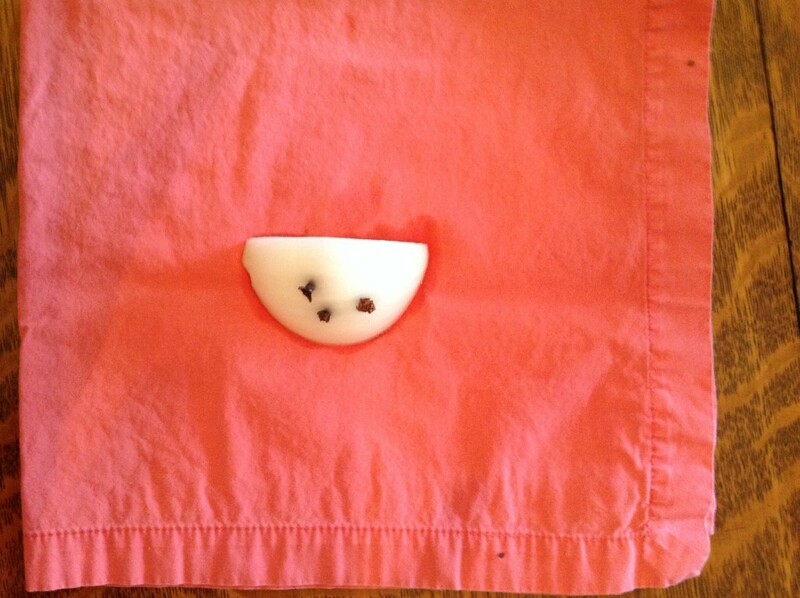 Press the cloves into one of the onion quarters. Using 100% cotton kitchen string, tie the parsley and bay leaf into a bundle (being careful not to break up the bay leaf). Add onion quarters, parsley bundle, wine, broth, carrot, celery, and thyme to the cooker. Cover and cook on the low-heat setting for 3 to 4 hours or on the high-heat setting for 1½ to 2 hours. About 20 minutes before cooking time is over, in a large saucepan cook the haricot verts, covered, in boiling salted water for 4 minutes or until barely crisp-tender (green beans will take a little longer). Drain. In the same saucepan, cook the mushrooms in 1 tablespoon of the butter until tender. Add the haricot verts to the saucepan; cover to keep warm. Remove the carrots, parsley/bay leaf bundle, clove-studded onion quarter, and celery stalks from the slow cooker; discard. In a small bowl, work the flour and the remaining 2 tablespoons butter into a smooth paste. Set the slow-cooker on 350° (or on High) and bring the liquid to a boil. Gradually whisk the butter-flour paste into the cooking liquid. Cook and stir until the liquid thickens and bubbles; cook and stir one minute more. Stir in the whipping cream and bring to a boil; stir in the haricots verts mixture. Cook until heated through. To sere, ladle stew into bowls; serve alongside rice, pureed potatoes, or noodles. 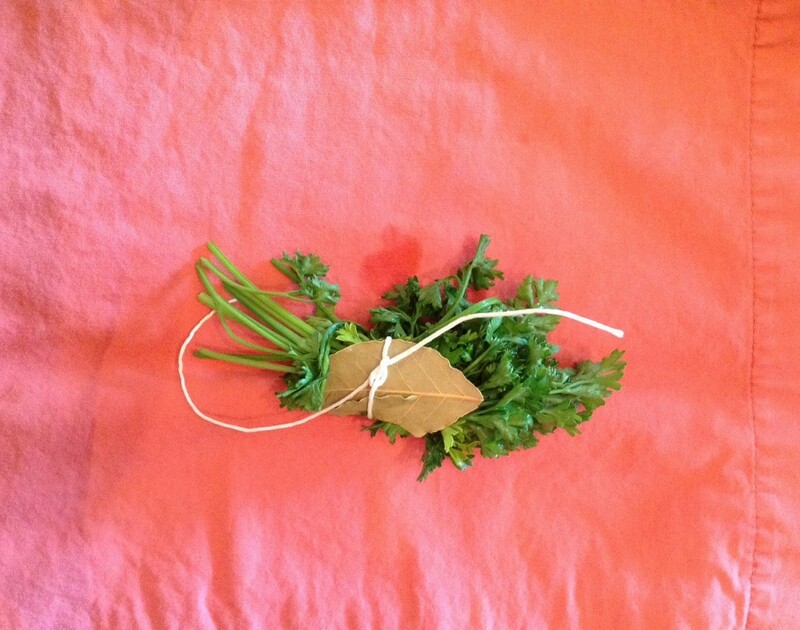 Garnish with fresh snipped parsley, if desired. I gave up cooking in a slow cooker because when I got done it looked like the dogs breakfast. This looks very appealing, maybe I will try again. Many thanks for your slow cooker recipes. I try to use mine as much as possible. Keep the recipes coming.